Select a shank size in the Categories to browse manufacturers. Most "American" euphoniums require a large shank mouthpiece. Any large shank mouthpiece (including those made for trombone) will fit a euphonium that requires a large shank mouthpiece. 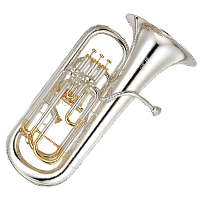 Some common examples of Large Shank Euphoniums are Yamaha 641, 642, and 842, Conn 19I, and King 2280, and Jupiter 570. 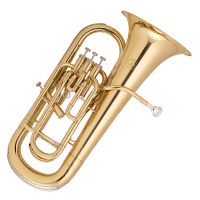 Some European-made Euphoniums, such as Willson and pre-1974 Boosey & Hawkes euphoniums, require medium shank. Medium shank is often called “European” taper. Most Baritones and many Euphoniums require a small shank mouthpiece. Any small shank mouthpiece (including those made for trombone) will fit a baritone that requires a small shank mouthpiece. 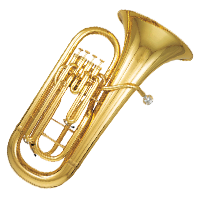 Some common Small Shank Euphoniums/Baritones are Yamaha YEP201, YEP321, YBH621, YBH321, King 623, 625, 628, Jupiter 470, 474, 468, and 464. Also most Marching Baritones and Euphoniums require a Small Shank mouthpiece.